University of Kentucky College of Law Professor D. Wendy Greene was one of several speakers who shared their expertise at the Health Law & Policy Institute's lecture series at the University of Houston Law Center. May 31, 2017 – The Health Law & Policy Institute's spring speaker series at the University of Houston Law Center concluded with three discussions that covered a wide-ranging set of legal issues. 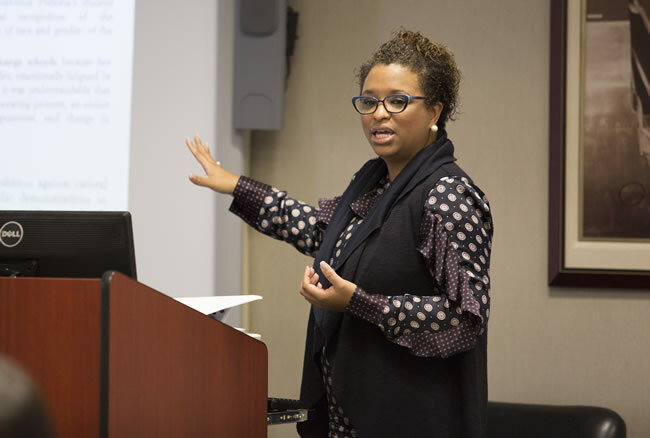 "The HLPI was excited to bring together a diverse set of speakers this semester to educate our community about the various facets of health law," said Professor Jessica Roberts, director of the institute. University of Kentucky College of Law Professor D. Wendy Greene's presentation, "Occupational Hazards: What's Hair Got to Do with It?" challenged widely held perceptions about workplace policies that regulate employees' hair. Greene said that in contemporary workplaces, women of African descent endure what she calls a "hyper-regulation" of their bodies via their hair. "This engenders racialized and gendered harassment, capricious workplace discipline, arbitrary loss of employment opportunities, and serious harms to African descendant women's physical, emotional, financial and psychological well-being," Greene said. The second talk, "Health Care Policy and Digital Health Under the Trump Administration," was led by Jodi G. Daniel, a partner at Crowell & Moring LLP's Washington, D.C., office who analyzed several of President Donald Trump's executive orders relating to health care. Daniel is also the founding director of the U.S. Department of Health and Human Services' Office of Policy in the Office of the National Coordinator for Health Information Technology. Daniel additionally explored the 21st Century Cures Act, which was enacted by Congress in December 2016. The goal of the legislation is to, "reform discovery, development and delivery of new treatments and cures and maintain America's global status as the leader in biomedical innovation." "The focus of the act included the reformation of FDA drug development and approval processes, investment in research, including precision medicine, substance use and mental health treatment," Daniel said. The final lecture of the semester, "Special Education Law Practice," featured Dustin Rynders, a supervising attorney with Disability Rights Texas, Pam Kaminsky, an associate attorney with Rogers Morris & Grover, and Karen Mayer Cunningham, an advocate for special education. Rynders, a 2006 alumnus of the Law Center, explained that practicing special education law can provide attorneys with versatile experience assisting families in and out of the courtroom. "Our goal in my office is to empower the youth and the parent," he said. "For those people who are interested in this area, know that there are opportunities to assist families in things that are not litigation, like meetings at the schoolhouse. But there are also opportunities to gain special litigation experience in special education as well." Kaminsky noted that plenty of tensions can arise between the parties in a special education law dispute, but the eventual goal remains the same. "There are great opportunities if you're looking to pursue a career in education law," she said. "Keep in mind we're all working for the same goal. Special education law is a little bit like national politics. "Everyone wants the same ultimate outcome. We all want children to succeed at school. We're all working toward the same goal we just often have different views on how we're going to achieve that." Cunningham, the lecture's last speaker, said enthusiasm is necessary for attorneys considering this career, and included that more representation is needed statewide. "If you're going to work in this space, you really need to love the work and the kids," Cunningham said. "Parents' most important part of their lives is their child, especially a child with a disability. If you want to work in this space, the good news for you is there are only six full-time special education attorneys in the state of Texas."